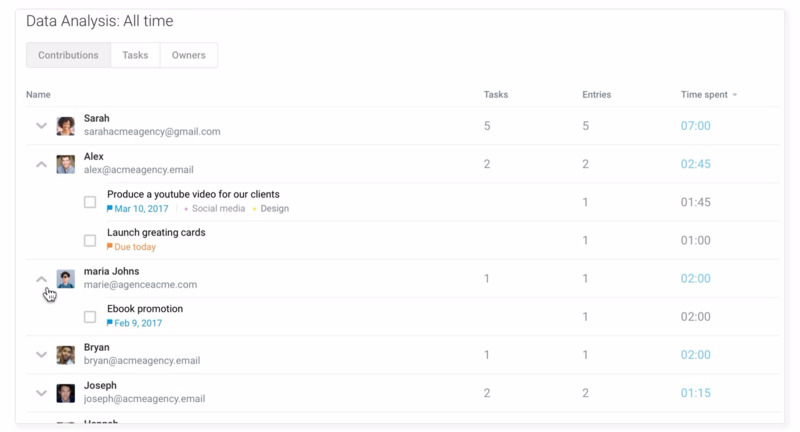 Once you have started tracking time in multiple tasks in a subject for a few days, head over to the subject analytics to gain valuable insights on how you and your team plan and spend your time. Select the subject you want to analyze, click on the ‘analytics’ tab and select ‘time’. All the data on this page is based on tasks where either time spent or time planned have been entered. The timeline represents the progress of your time spent and remaining on the subject. It is the aggregation of time entries and gives you an idea of the subject’s progress. You can choose to display 7, 30 or 90 days, with the possibility of choosing a time period to analyze. When hovering your cursor over the graph, you can see the detailed stats for any given date. This donut chart represents the total time spent by members on the subject’s tasks. It allows you to see at a glance who spent the most time on the subject. On this chart you can also display detailed statistics when hovering on any team member’s contribution. Time spent: represents the current total time spent on the subject’s tasks. Time remaining: represents the time planned that is not yet spent. It shows the needed time remaining to complete your subject’s tasks. Forecast: represents the best estimate of how much time your team will have spent in total once all the tasks are complete. It is calculated from your initial time planned + the remaining time. Overtime: represents the time spent on tasks that exceeds the time planned. Time gained: represents the time you gained on tasks. It happens when your team spent less time than planned and marked the task as done. Since the task is considered complete, the remaining time on the task becomes time gained. Time planned: represents the total time planned for your subject’s tasks. The detailed analytics panel includes three different tabs: contributions, tasks, and assignee. The contributions tab displays all the members that contributed to the subject by adding time spent on tasks, even if they are not the assignee for the tasks. By default they are sorted by time spent; clicking their name will toggle the tasks they contributed to and provide additional details. A contributor is a member that entered time spent on a task, whether that task is assigned to them or not. It can only be changed by editing the time tracking history of the task. 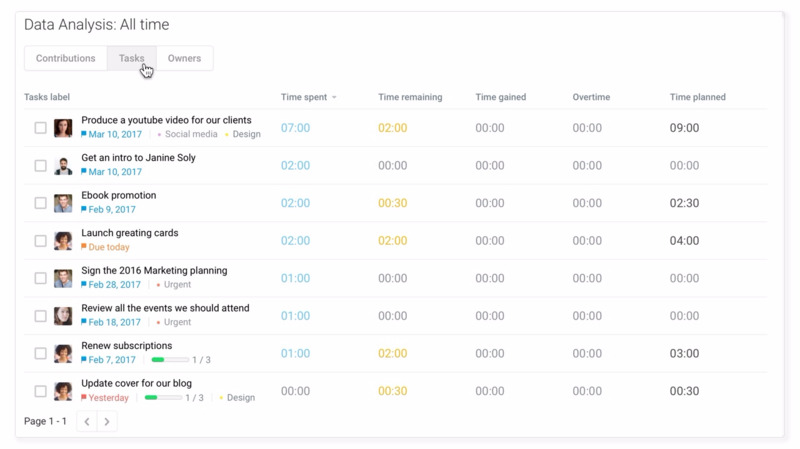 The tasks tab displays all the tasks that have planned and/or spent time, with additional details such as remaining time, gained time and overtime on each task. You can click on any task to open the time tracking history of the task, and sort them by column. The “assignee” tab displays the time tracking stats based on all the tasks assigned to a team member. The data displayed is based on the time spent on the tasks rather than the time spent by members. This view allows you to analyze the status of a team member’s assigned tasks. It reinforces the notion of responsibility for one’s tasks until their completion. An assignee is the task owner, which can change by assigning the task to another member or by unassigning the task. At the top of the time tracking analytics page you can select a period to narrow down your analysis. Click on the select a period button and click on an initial day to start selecting a period, then click again on another day to complete the selection. Once your date range looks good, click on the validate button. Need more analytics? Take a look at the workspace time tracking analytics for a global view of how your team is planning and spending their time.